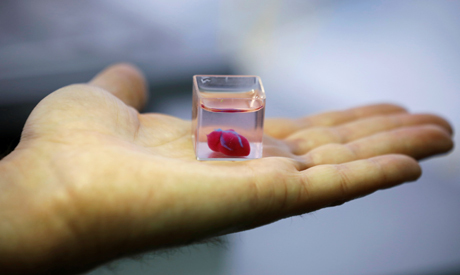 The heart, about the size of a rabbit's, marked "the first time anyone anywhere has successfully engineered and printed an entire heart replete with cells, blood vessels, ventricles and chambers," said Tel Aviv University's Tal Dvir, who led the project. Journalists were shown a 3D print of a heart about the size of a cherry at Tel Aviv University on Monday as the researchers announced their findings, published in the journal Advanced Science. Researchers must now teach the printed hearts "to behave" like real ones. Then they plan to transplant them into animal models, said Dvir.